A view from the cycle path: Shared Use Paths create conflict and cause complaints about "speed"
The "hype" is the thing that I find the most nauseating. The city planners/officials/whatever like to pat themselves on the back and say they've done a good job, when in fact they've only presented yet another means by which pedestrians can get annoyed at cyclists. When there really should never ever be that opportunity. Gah! This is an outstanding article. All of the issues raised are the regular, if not the overwhelming subject of conversation when it comes to cycling where I live (in Princeton NJ). Bike facilities are almost non-existent, cyclists use the sidewalk, pedestrians complain, and people write letters to the paper about 'outlaw cyclists' and openly discuss the idea of somehow shaming them by an organized blame campaign. It is a debased conversation. Of course, the reason why we have no proper bike facilities is because 'there isn't enough space' . I suspect this is the 'reason' for inadequate facilities in the UK too. On the other hand, do you think there is ever sense in mixing pedestrians and cyclists? Like in a 'shared-space'-type concept? The author is claiming it as "Dutch design", which I somewhat question, but since he's Dutch himself I'm not exactly in a position to dispute it. What do you think? And let's just ignore the traffic signal issue for the time being since it is wrapped up in disputes about provincial traffic legislation over which the city has no control (i.e. it's a deficiency but not one that the designers could do anything much about). I frequently see pedestrians using the entire flush surface, which seems a recipe for the same confrontations we get on multiuse paths. 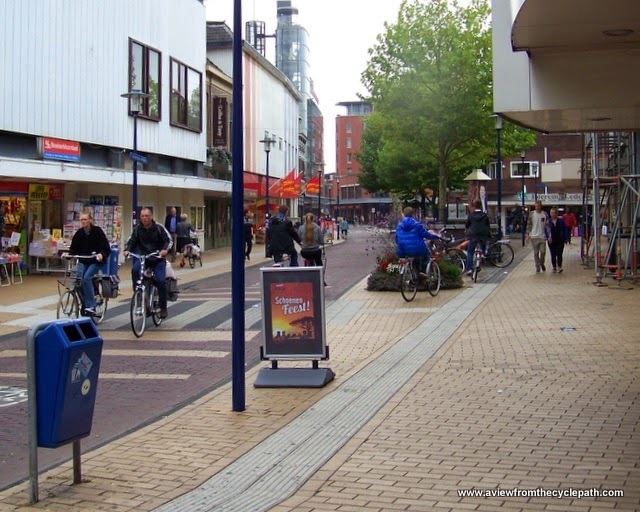 From my unfortunately brief recollection of Dutch cycling infrastructure (and from Google Streetview tours), Dutch cycling facilities are generally at the same level as the roads. One final point is that no rationale for this particular design of raising a separated bike lane to the sidewalk was ever provided in public, but it now seems to be Ottawa's de facto standard for future separated bike lanes. Hi David, thanks for sending that link. I also have doubts about how "Dutch" it is. The side-road crossing design has all the same faults as a similarly flawed one which I saw in Norway and I expect it will have the same dangerous result. In particular, the corner radii are simply far too large, encouraging drivers to enter the side-road at far too high a speed. Also the set-back from the road is almost non-existent in your example (i.e. not like this one). Your path also looks extremely narrow. It should be over 2 m wide for single direction use as otherwise it's difficult ever to overtake another cyclist. Oh, and at the traffic lights (I know you said to ignore that) it's especially lethal, requiring drivers to behave perfectly in order that cyclists don't die. That's not really the Dutch way of doing things. Cycle-paths in the Netherlands are not "generally at the same level as the roads", actually this varies. They're sometimes the same level as the sidewalk like your example. I don't think this is a particularly important point, they can be made safe at either level. The colour difference is at least quite obvious, and pedestrians may learn not to walk on the cycle part of the path, but if the path isn't wide enough for pedestrians to walk next to each other (or for cyclists to ride next to each other) then you're going to have conflict. As you know, I criticised the Ontario design standards a while back. This sort of looks like an improvement, but looking at the results I can't help but think they've sought out the wrong type of Dutch "expert" to help them. The setback varies a bit depending on which side of the street has the onstreet parking. We don't have parking "bays" like in the Netherlands due to snow clearing considerations so some of what you're seeing is actually onstreet parking - indeed snow clearing considerations (and fire truck design) result in a lot of street design features being passed over and the imposition of elements like large turn radii. According to the design documents, where there is parking, there's a 1.0 m road-bike lane separation and where there isn't it's a 1.95 m separation. The bike lanes are 1.5 m, the sidewalks 1.8 m. The travel lanes are 3.5 m (pretty typical for streets with designated bus routes). There's also a 2.4 m parking bay in the cross section on one side, which space is also used for bus platforms. The remaining metre or so in the 20 m cross section is used for retaining walls, fire hydrants and hydro poles. Sidewalk width becomes an issue when there are more than two pedestrians walking together, which mainly happens when school children are walking home. So the only real way to increase bike lane and sidewalk widths to 2.0 and 2.5 m, respectively, is to remove the 2.4 m parking bay. Once that is done, there is no room left to increase the separation from the road. As it is, parking has already been removed from one side. On traffic signals, that may change soon. The Province is coming under heavy pressure from the cities to update its rules, and establishing "facts on the ground" like this is part of that pressure. Still, they could have employed standard-sized regular traffic signals on an interim basis, strange as it would look. I'd suggest sending all the shared space advocates to visit a "shared space zoo" where there are no cages and everything's running about free, let's see how well that works. There's a reason why they don't put mice in the same enclosure as big snakes and it's the same reason why cycling on the road is horrible and why shared use paths should be forgotten. Segregated infrastructure works better, is a pleasure to use and isn't expensive. SFB: Sorry I overlooked your question. I don't think there is any good reason to consider 'shred space'. The safety record of these places is atrocious and they disenfranchise the vulnerable. Quite unaccetable. Don't cnfuse shared spacewith the much older and more successful autoluwe concept. David: The huge corner radii are th most obviously bad detail. Cars and bikes don't cross at anything like 90° and this will make it difficult for drivers to see cyclists at the same time as encouraging them to keep up an overly high speed though the corner. 1.5 metres is far too narrow. I can't think of any cycle-path near here which is so narrow, even relics from the 1980s are wider than that. It's quite common in NL for road lanes to be 3 m wide (buses still fit) and for parking bays to be narrower than yours as well. So there is enough space there. Hi, the path through Hyde Park where Jeremy Vine was stopped by police is a segregated cycle path. It is very crowded and peak hour flows are well over 1000 cyclists an hour. 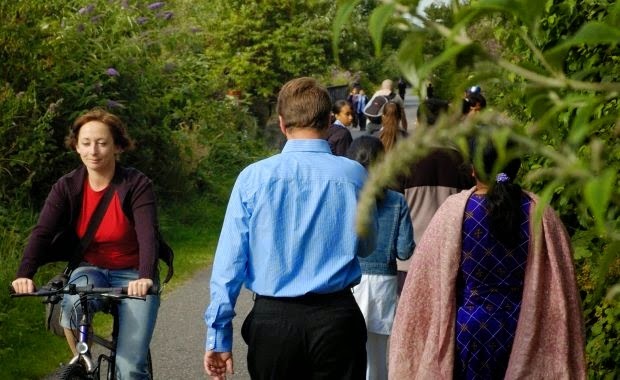 Campaign groups have lobbied for cycling to be allowed on more paths and for safe junctions allowing easier access to the roads where cyclists can easily cycle as fast as they like. The segregated path causes problems by encouraging cyclists to go too fast, speeds of 25-30kph are not uncommon. Under English law there is no method of ensuring pedestrians don't walk on the cycle side of the path and as the Royal Parks cyclist code of practice says: pedestrians have priority. The police action was in response to children being injured by reckless cycling on this path. It would work much better as an un-segregated path, similar to the route through Vondelpark in Amsterdam http://is.gd/0QtPgj Perhaps a 20kph speed limit would help. Speedy cyclists should be encouraged onto the parallel roads by better provision there. Charlie: If you think there's no separate provision for pedestrians in Vondelpark you really should go and take a closer look. Paths there are wide and suitable for far higher speeds than 5 mph by bicycle. The problem in Hyde Park is inadequate provision for everyone. Cyclists and pedestrians alike are squashed onto a path which is far too narrow and has "segregation" by means of nothing but paint. It's rubbish. I'm rather disappointed to find that on behalf of LCC you're joining in with the sack cloth and ashes approach, blaming cyclists and suggesting that they should be elsewhere. Cyclists don't need "friends" like this. David, thank you for your kind words. My experience of cycling in Vondelpark is that most pedestrians and cyclists comfortably share the tarmac paths for getting around. If the pedestrians are meant to only use the gravel paths they happily ignore that advice much of the time. I think my views on Hyde Park are closer to yours than you imagine. The current system doesn't work, I am not proposing that cyclists go elsewhere rather that they be allowed to go everywhere. The path by Rotten Row then could be returned to shared use to encourage comfortable sharing as in Vondelpark. Pyrmont Bridge is an interesting example, in the morning rush hour some segregation on the bridge would be better for cyclists and commuting pedestrians. In terms of access and exit the north side of the bridge would be better. During the day, the evening peak and at weekends the bridge becomes a massive tourist/leisure location, most of the pedestrians preferring to be on the north side with views over the harbour. It is difficult to reconcile both situations so the current layout might be the best compromise. 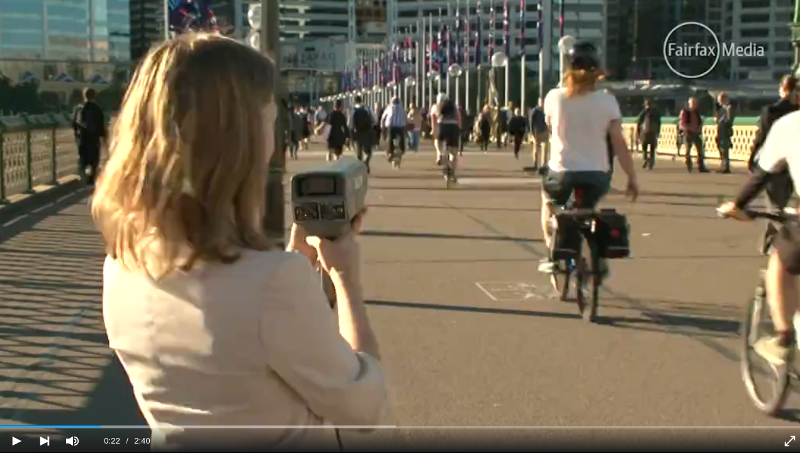 As signed cyclists are directed to give way to pedestrians, which is good but the 10kph speed limit is far too low and likely to lead to indiscriminate enforcement. 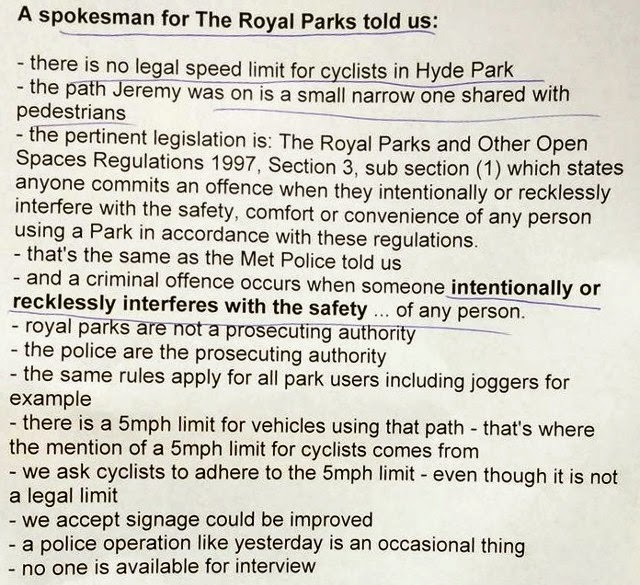 Happily after the police fiasco in Hyde Park last month we were able to establish that the 5mph (8kph) speed limit is not applicable to cyclists and should not be enforced. Thank you very much for your blog - it's very impressive! I was wondering if you could help me - I'm trying to understand whether cycling's modal share has plateaued (sp?) in NL or if it's continuing to increase. Are there any english-language sources that cover this? I've had a scan through some of the sources you link to, but couldn't track it down. Paul, there is little if any published research on this. However, policy in the Netherlands now is nowhere near so friendly towards bicycles as it was 10-15 years ago. I think the Netherlands has peaked. Sadly, the country has started to substitute marketing and BS for actual engineering where cycling is concerned. It is a criminal offence in England to recklessly or intentionally interferes with the safety of a person. Does this mean that we could make a citizens arrest on the DfT and TFL bosses who tell their engineers not to add cycle infrastructure because the excuses they make don't add up, cost, road width, congestion causing, confusing, etc, and because they haven't cared enough about the consequences of this on people? And present the list of excuses you wrote up, and the emails and designs made by people like Maidstoneonbike, Rantyhighwayman, Schrodingers Cat, even you David, to show that they could not claim ignorance because the information is easily out there and even a weekend in the Netherlands would be enough to see how it worked, and TFL isn't a poor organization nor is the DfT and you've even offered a tour for free to Boris or his engineers, or both. What do the Dutch call the pathways in rural and exurb areas where pedestrian volumes are very low and the pedestrians walk where the bicycles do, and if there is a bicycle path next to the road, designed of course like a bikeway, continuity at junctions, priority over minor side roads, smooth, wide, subject to bicycle signals not pedestrian green mans, what is that called to a Dutch eye? Shared use paths almost seem the correct thing in English, but it feels wrong because it feels like shared use means that cyclists become pedestrians at junctions, they have to dismount for the most minor of obstacles, and being very narrow, and located where pedestrian and bicycle volumes would be high. Cycle-paths in the countryside on which you have to walk because there is no separate provision for pedestrians are called cycle-paths. This is exactly analogous to how roads in parts of the countryside where there is neither a cycle-path or a pedestrian path are called roads. I explained this a year ago. Hmm. It seems to me that the argument that I'm hearing here is almost identical to the one often put forward by some motorists that cyclist "get in the way / are a nuisance / slow my journey down". In society, there is always a need for consideration and compromise, a lack of which is evident just about everywhere you care to look. I ride a bike regularly. I choose to do this for a number of reasons - it is better for me and the environment, it's often more pleasurable than sitting in a car / train / bus, it is a fun activity etc. Sometimes it is quicker but sometimes it is only as quick as walking because of the number of pedestrians. Yes, in a perfect world, there would be completely segregated routes for pedestrians, cyclists, motor vehicles and one must assume, each of those again sub-divided to accommodate varying speeds and God help any car / bike /pedestrian / wheelchair user that slows down the journey of anyone else. I see it now. The Lycra clad racer bearing down on the little old lady that has the temerity to cycle at a more sedate speed. I do see that there are a couple of solutions to the problem. Pay an extra 10% income tax to fund the required (desired?) infrastructure (this would also fund a proper health service / education system / welfare programme etc. etc.) 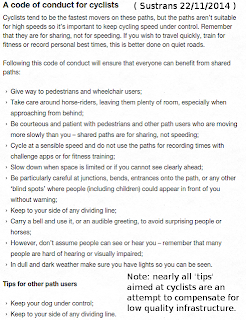 or alternatively, use the "shared" paths in a considerate manner. The Chinese have a view of Heaven and Hell whereby both have a plentiful supply of food except that the problem is that the chopsticks are six foot long. The only difference being that in Heaven, people feed each other. Stop blaming everyone else and look to yourself first. Bird: I think you've misunderstood the emphasis and meaning of my article. Shared Use paths are bad not simply because they are inconvenient and result in danger for both cyclists and pedestrians, but because that inconvenience and danger results in fewer people cycling and more people using motor vehicles. Drivers in cars do not expect their journeys to be made at walking pace. Society provides infrastructure which enables drivers to proceed at much higher speeds than either pedestrians or cyclists. Why is this courtesy extended to drivers but not to cyclists ? When you blame "lycra clad racers" for conflict you are blaming them for conflict which is the inevitable result of inadequate infrastructure being provided. For safety, your little old lady requires her own space, separate from both those lycra clad racers and from motor vehicles. We should not put fundamentally incompatible users in the same place. That is what creates the conflict. Somehow everyone can see this when it comes to motor vehicles, but due to a misunderstanding of the differing needs of cyclists and pedestrians there are many people who do not see the problem caused by giving those groups "shared" infrastructure. Finally, your assertion that an "extra 10% income tax" would be required to provide proper cycling facilities is simply not true at all. Actually, it's cheaper to provide proper safe and convenient infrastructure for cycling than not to provide it. Why ? Because even the best cycle-paths are far less expensive to build and maintain than roads for cars, and of course there are also many other negative costs for cycling infrastructure when we add up all the other damage which comes due to driving such as millions of people suffering from health issues, millions of deaths and continuous enormous expenditure on a military involved in fighting wars for oil. I've only been cycling 6 months but I am comfortable on the road and quite competent and visible. I don't like seeing cyclists on the path when it is not necessary, but i understand the fears some have of the road . I always assume Audi drivers are going to do something stupid, I tried hard not to do this initially thinking I was being somewhat discriminant, but it can't be helped. I recently saw new Audi A6 with a toddler at the wheel on his Dadas knee coming towards me on a country lane, he was going under the speed limit to be fair. Road users have no idea about popular cycle routes... This was on the sustrans the day after a Dog show near Corbridge Northumberland. I find it astounding that people will stand in the middle of the sustrans cycle routes while watching their dogs run around. A pair the other day refused to move over to a side after seeing and hearing me come from quite a distance, they were seeming to think I was going to pull onto the wet grass to go around them. It is times like these I have no problem picking up the pace and asking if they are effing blind at the top of my lungs as I narrowly miss collision ensuring I cycle directly between the two of them. I had a woman stand directly in my path over a bridge wagging her finger demanding I walk over a bridge crossing. The decrepit monkey skeleton was treated no differently. I don't get any satisfaction out of acting this way, I'm a thread away from getting myself kitted up like one of those robocop camera cyclists I despise so much. I have only just come across this article. It has much that Cycling UK would strongly agree with - as is usually the case with your often excellent blogs. However, from time to time, you are prone to attribute views to Cycling UK that we do not hold. This article contains an example. You suggest that Cycling UK (which was then named CTC) was part of a joint call for cyclists to "take action by pointing the finger" at other riders. That is not true. We were not asked to endorse these comments, nor would be have done so had we been asked to. Let me start by saying that we fully support the central argument of this blog, namely that the real solution to conflict between different user-groups (whether between pedestrians and cycles, or between cycles and motor vehicles) isn't simply to appeal to people to behave safely. We need to design out conflict, by creating separate provision wherever the volumes and/or speed-differences between user groups makes it unsafe and/or uncomfortable for different user groups to share space (this being a particularly acute problem between cyclists and pedestrians where there is insufficient space, inadeqaute sight-lines and/or where gradients are present). Nonetheless, appealing for respectful behaviour is a reasonable way to deal with situations where this separation doesn't exist (e.g. most of the UK!). As I said in my quotes about the Sustrans code (which we endorsed), Cycling UK support responsible behaviour by all road users: drivers and cyclists alike. I also stand 100% by the quotes I gave at the time about the need for cyclists to respect the desire for pedestrians (including the most vulnerable) to be safe and to feel safe, in the same way that cyclists want drivers not to endanger and intimidate them. What Cycling UK does NOT do though is to pander to the ideas that cyclists are in some way more irresponsible than other road users, or that individual cyclists somehow have a duty to tackle the irresponsible behaviour of fellow cyclists. In other words, we'd also agree with your criticisms of the "sackcloth and ashes" approach to cycle campaigning. I'd therefore be grateful if you would correct the paragraph that suggests we were party to it. We weren't! Roger: Thank-you very much for your response. I'm afraid the "pointing the finger" part of my blog post is not something you can attribute to me. It's a quote from Malcolm Shephard, then Sustrans' chief executive. He made this comment to the press at the time when Sustrans and CTC were announcing joint support for the Sustrans "code of conduct". I linked to my source above but here's the same link. Malcolm went further at the time, suggesting that "reckless cycling speed demons" (also his words not mine) were a problem. If Sustrans' comments at that time did not reflect CTC's view then perhaps they were not the best people with whom to link yourselves. I didn't previously write about your comments made at the time of the "code of conduct", which you "stand 100% by", but some of these were also unhelpful. E.g. 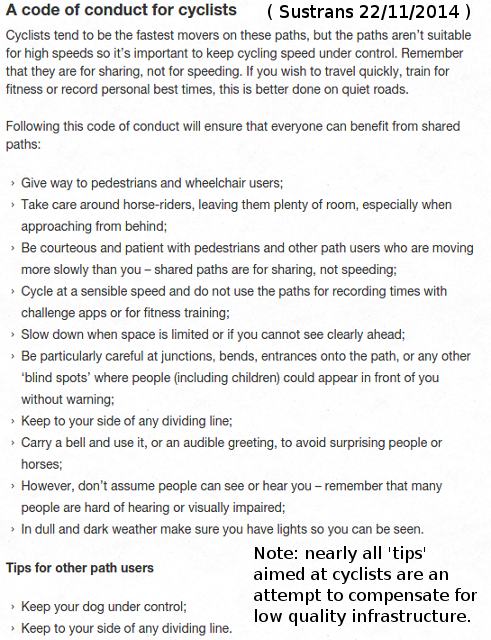 "walkers can feel as intimidated by fast cycling on shared use paths as cyclists are by fast driving". This created a false equivalence. Such comments give fuel to an anti-cycling press which treats cycling as a "danger" comparable with the danger due to driving when this is very obviously not so. A false equivalence is often made between peoples' views of what "fast" means for a cyclist on a shared path relative to what "fast" means on a road. Roads routinely permit driving at 70 mph while cyclists can be criticized for "speeding" at 10 mph. I've ridden many thousands of miles on British roads, including some of the most lethal A roads (because progress was agonizingly slow on shared paths) and I can categorically assure you that the degree of intimidation and danger, not to mention risk of actual injury and death, faced by cyclists on roads is not comparable with anything which happens on a shared path. In your reply I see that you have again created a false equivalence. You suggest that "drivers and cyclists alike" should behave responsibly. It sounds seductive, but it's not actually reasonable for several reasons. 1. We don't let children drive cars, but we encourage them to cycle. Would we do this if we considered that cycling created equal danger? We cannot call for children on bicycles to behave responsibly in a way which is "alike" to your call for responsible behaviour from motoring adults as children don't have the capacity to do this. Over here in the Netherlands our law reflects that reality and that is why it gives greater rights to those aged under 14. 2. To view the potential for danger from cyclists as being in any way comparable with danger from motor vehicles is to take a view which is very distant from the facts. Motor vehicle crashes kill over a million people a year worldwide and injure 50 million others. Even warfare does not kill and injure so many. Human powered vehicles don't have the potential for anything like this degree of lethality. In my view, both strongly negative comments such as Malcolm's and your own false equivalences harm the cause of cycling. Editing the blog post to remove the phrase with which you disagree would have left your comment as a reply to something which no longer exists. Therefore I've edited the blog post only in a way to direct people to read these comments as well.